“Summer is almost over,” said Bluefeather. “I like winter better,” Prickle answered. “Mmmhmmm.” A dreamy glaze came over the eyes of the two fairies. Prickle licked her tiny lips. “Hey, you two! I’ve got weapons for you.” Burndog flew up with his arms full of flint knives. “Psst!” Prickle and Burndog turned to look at Bluefeather. The three fairies attacked. The shrill screaming of the rabbits filled the night. “Yum, meat!” Prickle gloated as she cut her prey open and started to eat. Nobbig was making too much noise. Four Goblins splashed through some of the shallower waters of the Great Sump. They worked in pairs as they hunted for their supper. muddy that his splay-toed feet kicked up mud and water with every step. He had a bamboo spear in his left hand – the perfect frog sticker. It was just a hollow cylinder of reed with one end sharpened. “Do you have to make so much noise?” complained his partner – another goblin named Glumb. Unlike Nobbig, Glumb could glide through the swamp and never leave a trace. Rrribbet! The bullfrog’s croak was surprisingly loud in the night. Nobbig looked around apprehensively. searching the reeds and weeds and lilypads. Every ripple could be their targets. As the water got deeper, frogs and other creatures began to appear. Fishy shapes darted between their legs and larger serpentine bodies sometimes pursued them. big bullfrog, but he missed. “I’d like to see you do any better!” snarled Glumb. blood trickled down its bulging stomach. “Get down!” hissed Glumb. The two Goblins hunched down until only their eyes and nostrils were above the surface. The shadow of a monstrous dragonfly fell across the water, and a huge insect buzzed above them. Luckily, it did not stay long. Two little goblins would not be enough to satisfy that bug’s appetite. got back to an upright position. They started off. Nobbig didn’t splash nearly as much as he had at the beginning of the hunt. They had just emerged from the water when the biggest frog Nobbig had ever seen appeared out of nowhere. There was a mighty thump as it landed, and then the huge amphibian had its tongue around Glumb. and popped him right into its big, gaping maw. Goblins are ferociously brave. Nobbig and the other two members of the hunting party attacked. 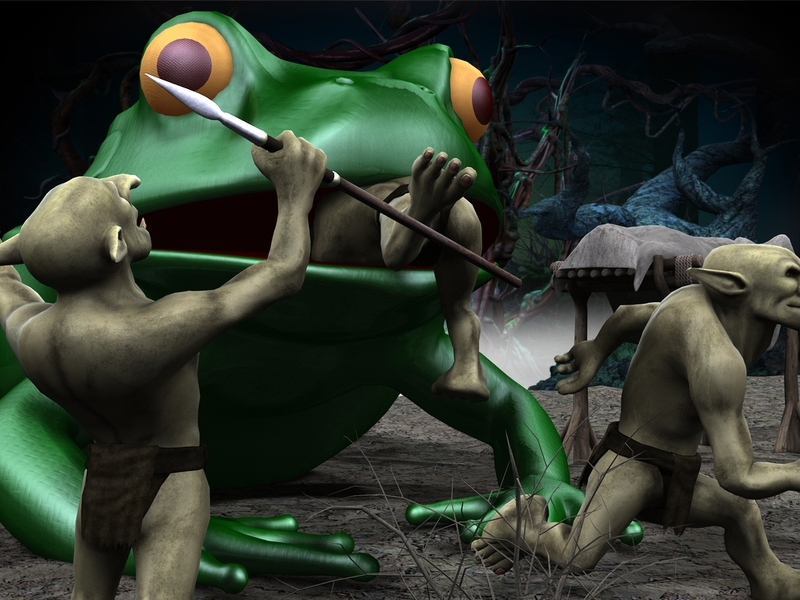 Even Glumb struggled inside the frog’s stomach–he wasn’t chewed up on the way down. 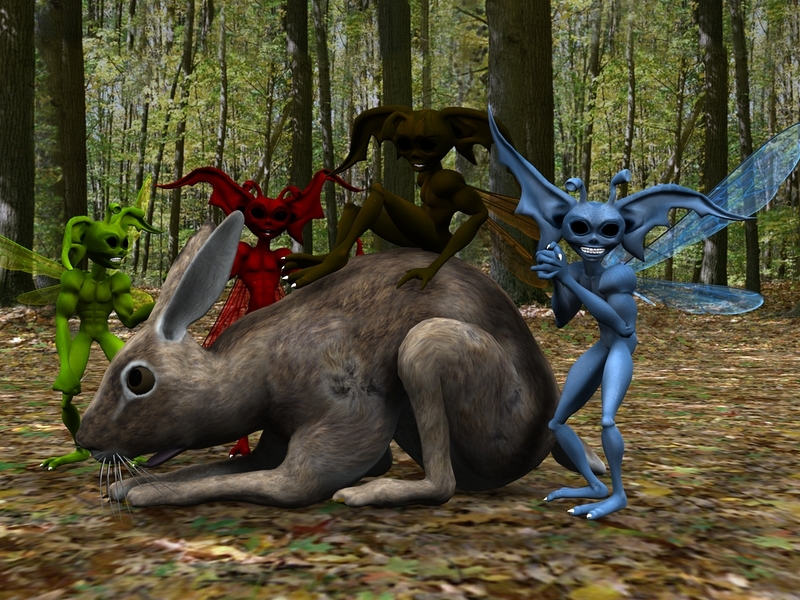 The Goblins fought with determination, cunning, and all the ferocity they could summon. And not a single one returned to camp to tell the tale. As the night vanishes with the placing of the last dew drop, Fetrina settles in on a tree branch to watch the sun rise. She breathes in a heavy, awe-struck gasp as the most brilliant sunrise decorates the sky. First just oranges, but then purples and dark yellows and reds join the pallette. Fetrina lies on the branch, her back against the trunk of the tree. As she puts her arms behind her head, she glances up briefly in “sun-rise-satisfaction” to see a most peculiar sight. A cloth in the branch above her is moving and making sounds. Alarmed, Fetrina flies above, but not too close. A fairy cannot be too careful, you know. What lies in that bundle strikes awe in Fetrina’s heart. It is a human baby, with deep hazel eyes and blonde curls. Nearby is a stork with a broken wing–it is near death. The baby is beginning to cry. With all of the calmeness she can muster, Fetrina flies beside the baby’s face, stroking her cheek as she says she will return in a moment. It takes some persuasion, but four squirrel friends return with Fetrina to help get the baby down. The stork has passed. Fetrina takes a few leaves to cover the stork, thanking the stork for protecting this baby. The squirrels bring the baby to Fetrina’s home where Fetrina is now debating with the Fairy Queen. Reluctantly, the Queen allows the baby to be reared by Fetrina. Perhaps it will give Fetrina some focus. After all, Fairies are called to serve and protect where they can. Alone again, Fetrina and the squirrels vow to bring this baby up to be the most beautiful, caring and gentle human possible. Her name, she must have a name. The baby coos as the last star gives way to the full sun. Naaaaaaaame…..ahhh……..Her name is Dawn-keeper of the morning light! There is much work to do. The story isn’t very trollish, but it is a lovely fantasy. I liked it, so I printed it.